While the vast majority of the episodes of Familial Shar-Pei Fever (FSF) seen in Shar-Pei run a fairly benign course there are occasional exceptions which can have life-threatening consequences. Over the last few years Streptococcal Toxic Shock Syndrome (STSS) has been seen more frequently as a complication of FSF in the Chinese Shar-Pei. STSS involves infection with a group G streptococcus called Streptococcus canis. In the Shar- Pei cases Iâ€™ve seen this streptococcal infection is a rapidly progressing, highly invasive process which results in a necrotizing faciitis and/or STSS leading to a shock-like syndrome and multiorgan failure. If not recognized early STSS can lead to death in 24 hours or less. A similar syndrome has been seen in human medicine, the so-called “flesheating bacteria”. I consider this a localized form of streptococcal infection. Dogs with NF tend to develop extensive soft tissue sloughing along fascial planes. Fascia is dense connective tissue which covers the muscles. Usually this syndrome presents as large areas of skin and the underlying fatty tissue dying and peeling away, hence it has been called “flesh eating bacteria”. Many of these dogs will survive with debridement or clearing away of the dead tissue, but healing is prolonged and skin grafts are often necessary. Long-term management is intense with frequent bandage changes, cleaning of the wounds, antibiotic therapy and the need for multiple anesthetic procedures to repair and reconstruct the damaged areas. The areas Iâ€™ve seen involved are often the hock joints, the flanks and the abdominal skin. STSS seems to be a generalized or systemic form of streptococcal infection. Streptococcus canis in a potent exotoxin producer and it is thought that in cases of STSS the toxin may be responsible for the rapid progression of sepsis, shock and multiorgan failure (MODS) in cases of CSTSS. On necropsy these dogs show severe edema of the gastrointestinal tract, congestion of multiple organs, severe pulmonary (lung) congestion and evidence of thromboembolism (blood clots) all pointing to shock due to sepsis or toxemia. These dogs typically die within 24-48 hours in spite of aggressive fluid therapy, antibiotic treatment and intensive supportive care. Recent information indicates that Streptococcus has the ability to produce hyaluronan lyases (similar to hyaluronidase in mammals) which are enzymes that can break down hyaluronan. We now know that low molecular weight HA has significant proinflammatory properties which may contribute to the severe vasculitis and tissue damage in STSS. Streptococcal pyrogenic exotoxins A and B induce production of tumor necrosis factor â€“ α (TNF-α), interleukin-1β (IL-1β) and interleukin-6 suggesting that TNF could mediate fever, shock and tissue injury in cases of STSS. One of the virulence factors, M proteins, contribute to invasiveness through its ability to impede phagocytosis of streptococci by polymorphonuclear leukocytes. Data suggest that the streptococcal exotoxin can stimulate T-cell responses through their ability to bind to both Class II major histocompatibility complex of antigen presenting cells and the Vβ region of the T-cell receptor. The net effect would be to induce T-cell stimulation with the production of cytokines capable of mediating shock and tissue injury. Clinical signs in the localized form of STSS, necrotizing fasciitis, consist of areas of skin bruising, dead skin and/or areas of sloughing where the skin is falling away. Usually there is a pus discharge from these areas. The dogs are very painful, running a high temperature, depressed and, in general, sick dogs. Often there is a history of an FSF episode, dog fight wounds, or other traumatic event. In the generalized or systemic form of STSS symptoms have a much more rapid onset and are more shock-like such as severe weakness, rapid heart rate, pale mucous membranes, extreme pain, collapse, coma and acute death. The lungs seem to be the primary site affected. Many of these dogs develop DIC (disseminated intravascular coagulation) which rapidly leads to multiple organ dysfunction syndrome (MODS) and death despite heroic efforts at treatment. The emergence of this disease has been attributed to the popularity of fluroquinolones for use in dogs. It has been shown that enrofloxacin can cause a bacteriophage-induced lysis of S. canis and superantigen expression which induces T-cell proliferation and excessive release of host cytokines with potentially lethal effects. Ingrey KT, Ren J, Prescott JF. A Fluoroquinolone Induces a Novel Mitogen-Encoding Bacteriophage in Streptococcus canis. 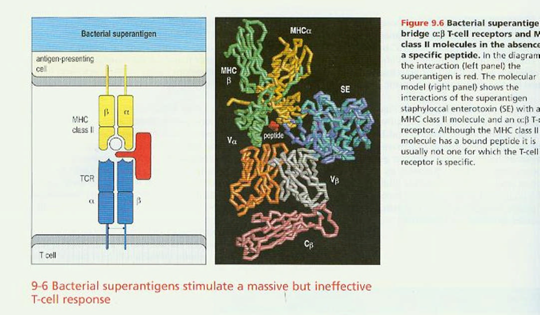 Infection and Immunity, June 2003: pp. 3028- 3033. The increased amounts of mucin in the subcutaneous tissues. The prevalence of FSF in the breed. The prevalence of dog fights and bite wounds in the breed. An increase in skin laxity resulting in more trauma. Perhaps an increased virulence of some strain of Streptococcus canis. Diagnosis is based on the history of previous trauma or FSF episode, bacterial culture and sensitivity of discharges or tissue samples, and clinical signs. One important point is that the organism is often resistant to enrofloxicin (Baytril®) and the aminoglycosides such as Amikacin® and Gentocin®. Consider the use of multiple antibiotic therapy with agents such as Clavamox®, cephalexin, clindamycin, lincomycin, erythromycin, penicillin and the potentiated sulfas. Of course, the best approach is based on sensitivity information from a culture, but that takes some time to generate. Treatment of the necrotizing fasciitis involves appropriate antibiotic selection and administration, and basic wound care of the affected areas. I have seen dogs have recurrence of necrotizing fasciitis with repeat FSF episodes. Usually they seem to slough out the same area every time. Treatment of the STSS involves intensive care with intravenous fluid therapy, shock treatment with IV antibiotics, pain management, steroids (? ), and intensive monitoring for the development of DIC, etc. At this time the prognosis for systemic STSS must be considered very poor. Increased owner awareness of NF and STSS, rapid initiation of appropriate antibiotic therapy and intensive supportive care are the keys to survival in this condition. An excellent article on STSS appeared in the October 15, 1996 issue of the Journal of the American Veterinary Medical Association, Volume 209, Number 8, pages 1421-1426 by C. Miller, J. Prescott, K. Mathews et al. entitled “Streptococcal Toxic Shock Syndrome in Dogs”. At this time there is no evidence suggest that humans are susceptible to infection by group G Strep. However all humans involved in the care of these dogs should take common sense precautions such as the use of exam gloves, proper disposal of bandage materials, personal hygiene, etc. I would not recommend that these dogs be cared for by immunocompromised individuals, children, the elderly or physically ill people.